What is a charge carrier? How to calculate number density? With our number density calculator, you can estimate a charge carrier number density of specific metals. It is a physical quantity that describes how many charge carriers are in a volume unit. All you need to know are the density of a material, its molar mass and the number of free electrons. In the text below we have explained what is a charge carrier and how to calculate the number density of charge carriers. Recently, copper remains the preferred electrical conductor in almost every branch of electrical wiring. We can find it nearly everywhere. That's why we have also performed example calculations of charge carrier density of copper. Most of the well-known conductors are also metals. Do you know what happens when light falls on a metal surface? Check our photoelectric effect calculator to learn more about it! Charge carrier is an object which carries electric charge during current flow. The type of charge carrier depends on the structure of the material in which the charge is transported. For example, in metals, there are free electrons, and in semiconductors, there could be both electrons and electron holes. Every electrical circuit has a resistance (except superconductors) which can be described by Ohm's law. Charge carriers are slowed down by this resistance, and therefore they can't reach high speeds. You can check our drift velocity calculator to see how fast charge carriers are. Na is the Avogadro constant Na = 6.0221 * 10^23 1/mol. Remember, that above equation can be applied only to the conductors which have free electrons. 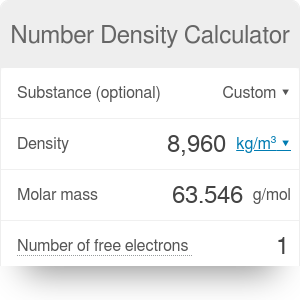 In our number density calculator, you can either choose a specific substance from our examples or enter your parameters. Copper is a metal which has high electrical conductivity, and for that reason, many electrical devices rely on copper wiring. Let's compute charge carrier density of copper with our number density calculator. Both the density of a material and molecular mass of copper can be easily found (we have provided them as an example substance). Because copper has only one free electron per atom, its charge carrier density is 8.491 * 10^28 carriers/m³. It's very hard to imagine how many of them are in one cubic meter. Astonishing number! Number Density Calculator can be embedded on your website to enrich the content you wrote and make it easier for your visitors to understand your message.